Tucked right at one corner of the city center is the Songket Restaurant, a Malay restaurant featuring harmonious traditional + modern cuisines that are suitable for various palates. 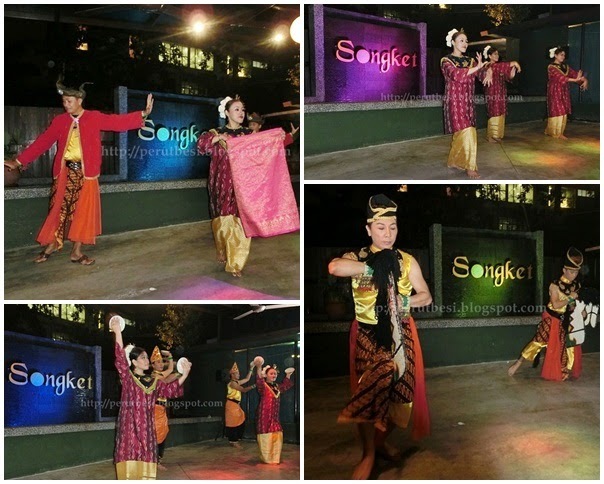 I find this restaurant's concept especially suitable for tourists who would like to experience both a good variety of food & traditional dance performances. 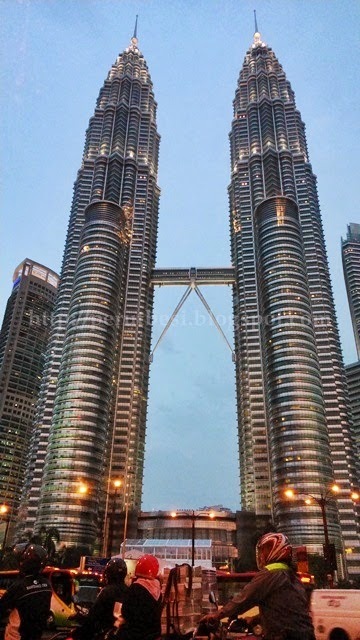 A "minion" amongst the "giant" sky-scrappers, but with HUGE flavours & experiences to offer! 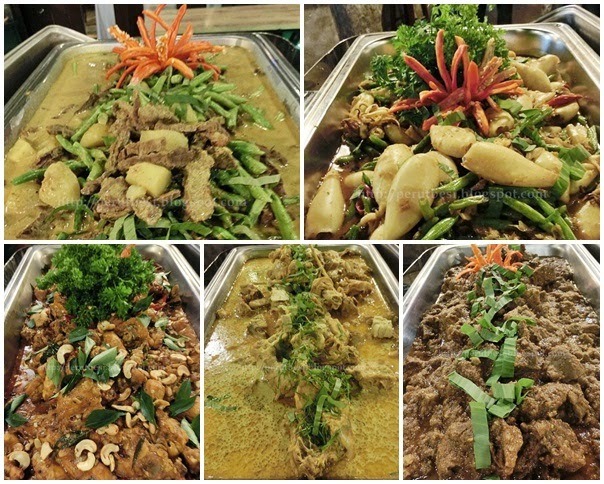 The restaurant's kitchen is headed by Chef Umar, the executive chef with 17 years of working experience as chef & have been around with Songket for the past 2 years. Chef Umar & his team of passionate kitchen crew are constantly improving & serving guests at Songket with new/improved dishes, reviewing their menu once every 6 months. 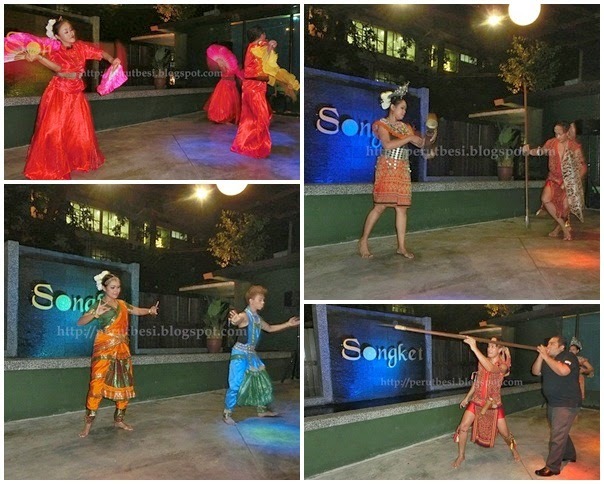 Songket Restaurant usually serves ala carte dishes, but buffets can be arranged for groups with a minimum of 30 persons. Their dishes are richly infused with local/Asian herbs & spices plus fresh ingredients from their suppliers. We were invited not just for the launch of Songket Restaurant's new & improved menu but to celebrate their 4th Anniversary together with the rest of the media & business partners as well :D There were approximately 100 persons at the event, so the restaurant served their dishes in a buffet spread. Char-grilled whole leg(s) of chicken marinated in tumeric & ginger, & drizzled with lightly-spiced coconut gravy. Whole seabass steamed with Songket Restaurant's special mango sauce. 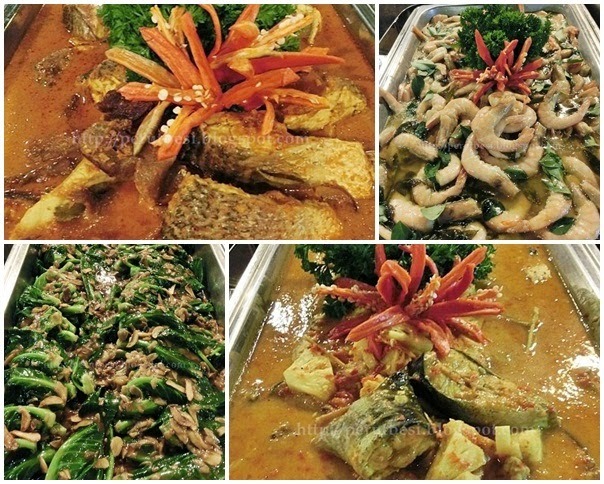 Here at Songket Restaurant, guests have a choice of 7 types of fishes & 8 methods of cooking. All you need to do is to pick your choice of fish, the method of cooking & just await to be satisfied with your personal preference! Ikan Tongkol/Local Tuna (5 pieces) & Ikan Patin/Catfish (4 pieces) costs RM30.00/serving each, Ikan Bawal/Whole Pomfret costs RM45.00/serving, while the rest of the fishes like Ikan Senangin/Whole Senangin Fish, Ikan Siakap/Whole Seabass, & Ikan Jenahak/Fillet of Golden Snapper (450g) costs RM65.00/serving each. Deep-fried senangin fish simmered in a spicy gravy of chillies, turmeric, kaffic lime leaves & coconut milk. Char-grilled slices of Australian lamb loin & ribs marinated with traditional spices, served with sweet-spicy peanut sauce. According to Chef Umar, the lamb loins are grilled (bakar) before roasting/oven-baking (panggang) to ensure that the moisture of the meat is "locked-in". The meat is marinated with the traditional satay/peanut sauce ingredients over-night before it's cooked to perfection. Really interesting. I've never had a "satay-marinated char-grilled lamb loin" before! Yet to try it out! The dish is also served with a side of the traditional "bergedil" (fried mashed potatoes + meat patties) that resembles potato wedges. Traditional tiramisu (non-alcoholic/halal) flavored with creamy D24 durians, served with a shot of "fruit compote"
I asked Chef Umar if the compote was part of the "bold" tiramisu & he said "yes!". As the tiramisu is rich & may be cloying to some, the compote gives the heavy dessert a refreshing 'lift' to cleanse the palate when you feel "jelak" :D I'm impressed. Have to try this next time. A Malaysian favorite, eight pieces of skewered chicken & beef fillet marinated in spiced honey & grilled over charcoal fire. Served with condiments & homemade peanut sauce. All their dishes that are cooked with coconut milk are really rich, creamy & nicely infused with herbs & spices (not over-powering). I could taste the aromatic kaffir lime leaves from some of the dishes like the Ayam Masak Lemak Nangka, a rather 'new' dish to me :) Yums! I must say that the Ikan Masak Lemak Tempoyak is really delicious (rich, creamy, aromatic...oolala...)! For those who do not fancy durians, this may be a "put-off", but I've to say that it's a dish that you can rarely find in typical Malay restaurants. Must try! 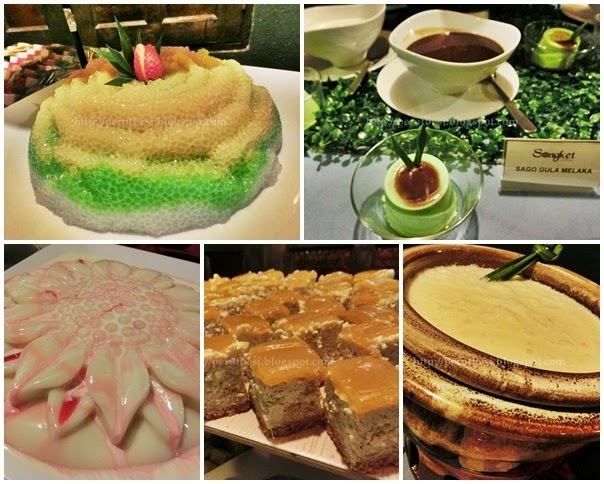 To conclude the traditional meal, we pretty much had "free-flow" of Malay traditional desserts from the buffet line. Those who know me will know that I'm not a fan of sweet food, but I still tried some of the desserts just to find out how the dessert here tastes. It's no doubt very sweet...haha...but the pancake wasn't too thick, so the texture was still pretty satisfying. Sweet & slightly savoury - I'm not a great fan of Nyonya kuih, so I can't really comment if these are really good...haha. 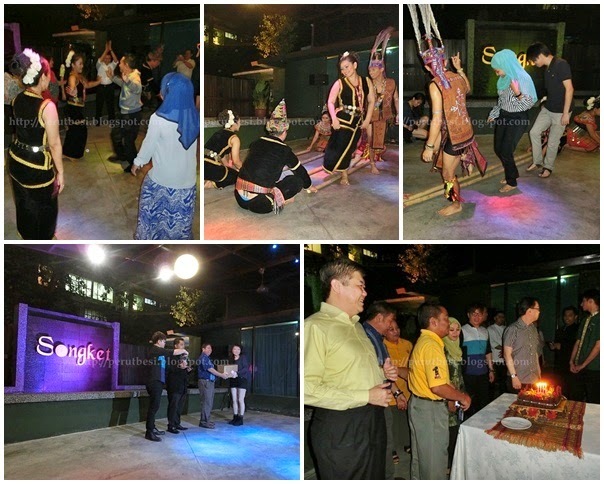 L->R:Tarian Joget Kadazan & Tarian Magunatip Buluh Kadazan/Kadazan Bamboo Dance, Cake Cutting Ceremony, Lucky Draw Prize Giving - one of our blogger friends won a lucky draw prize! Sat/Sun/Public Holidays 5:00p.m. - 11:00p.m. Overall comment: Enjoy an interesting array of fusion Mediterranean-inspired food in a cozy ambiance. Their cocktails are pretty good too! It's been a LONG while since I attended a food review session. The past month has been a rush to complete my work project & have the system go-live. I'm relieved that I now have some time to breathe & write again! Oh, how I miss blogging! I started this week on a "food-adventure-friendship" a.k.a. "The Ruthless Eater" tone, clearing my Monday blues with a good meal & fellowship at Blu Med, The Gardens, Mid Valley. The restaurant actually looks pretty "posh" that from a glance, I wouldn't have thought of going in for a meal, thinking that it'll be too expensive. I'm glad to be proven wrong this time around! Who would have thought of putting these 3 ingredients together? I wouldn't, for sure! Very, very fascinating. Sweet, savory & juicy in a single bite...haha. I'm a great fan of eggplants & I have to say that this dish was a success! It's probably my favorite of the night :) The hearty-sized pieces of eggplants were crispy yet light on the outside & "juicy"/moist on the inside. The tomato sauce mixture was really tasty & the portion of cheese was generous as well. Thumbs up! I know my AP would LOVE this! Not overly oily, not over-cooked, not under-cooked. Perfect! Such thin-crust pizza topped with teriyaki chicken slices, fresh lettuce, & homemade mayonnaise is best shared with family/friends. The combination of ingredients strikes the memory-chord of eating a chicken burger! It felt slightly strange to be eating a "pizza-burger"...hahaha...but it's still quite tasty nonetheless. This was my sister's favorite. Twirl your fork into the plate of linguine al dante, tossed in tomato-prawn cream (prawn heads + shells: sautéed for 1 hour & stewed for 2 hours to get the stock) & served with crispy soft-shell crabs! Fuh. The prawn flavor was so rich & evident that it felt like eating a western-style "prawn mee" (Penang hokkien mee). Nice! They used bottles & wine glasses - brilliant idea! Drooling already? 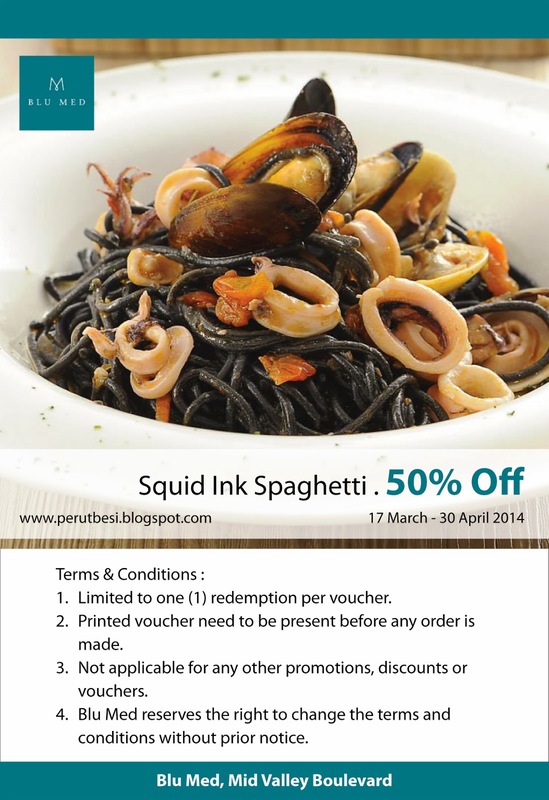 Blu Med & PerutBesi would like to treat all readers of "The Ruthless Eater" to the special Squid Ink Spaghetti at half the price for a whole 1 1/2 months! Just print out this "photo"/voucher & present it before ordering. Business hours: 7:30a.m. - 12:00a.m. Will be visiting Blu Med again!